Yeah so what was supposed to be a small get together for all my rad Perth readers has turned into quite the extravaganza! Not that I’m complaining. During the planning process the horrible earthquake hit HAITI and I decided, along with my good friend Chris Hemingway (stay tuned to the blog to meet the geezer) to do my bit and help out – every little helps after all. 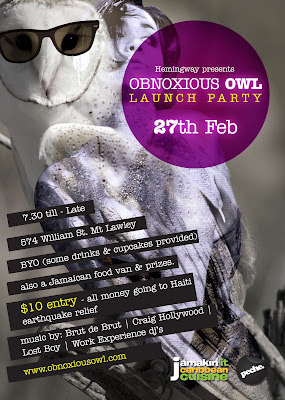 There will be beer, a Jamaican food van that Hemingway tracked down at the recent RaggaMuffin Festival, owl cupcakes, a pretty impressive music line up, prizes and much much more! I don’t want to give too much away in my excitement but you would be mad not to join us. PLUS I wanna meet you all face to face! Just don’t ask for any advice…I might not be in the right state of mind to give it and you’ll end up looking more like Coco the clown than Coco Chanel. AT times like these I regret moving. Have fun! Just wanted to let you know that I'm have a wine tote giveaway on my blog in case you were interested in entering!